Ulster University is delighted to be amongst exhibitors as the STEM Village returns to AirWaves Portrush in a prime new location. 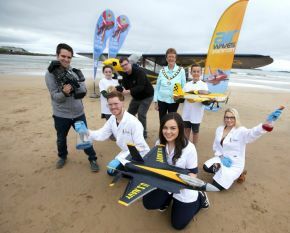 Choosing a career is one of the most important decisions you will ever make, and that is why the Causeway Coast and Glens Borough Council has brought the STEM Village to Portrush Airshow. At the STEM Marquee, you will find lots of interactive fun and learning experiences to help you discover what interests you. As one of the key exhibitors, we hope to inform and inspire people of all ages, whether it is to improve your own health, encourage you to study at Ulster University or engage in pioneering research which could change lives. Ulster University will be represented by staff and students from across Biomedical Sciences, Pharmacy, Health Sciences, Nursing and Sport. We will also be hosting a competition to win an iPad. This is open to A-level, BTEC, ILC and GCSE (or equivalent) students. Have you ever wondered how to put the 'fizz' in bathbombs? Would you like to extract DNA from strawberries using common household items? Are you interested in learning how to adopt a more balanced diet? Or are you curious to know more about your organs and the human body? Then, join us at the STEM Village to find out more. Further information is available at airwavesportrush.co.uk. You can also follow @STEM_Airwaves for regular updates.